Kochi: The Kochi Metro Rail Limited (KMRL) has broken new ground to gain substantially from the Automated Fare Collection(AFC) system by roping in a private partner to make necessary investments in hardware and software for sale of tickets besides getting assured annual royalty and a share in the business returns of the partner. Axis Bank will install the required complex hardware and software for fare collection from passengers and in addition will pay KMRL Rs. 208 cr over the next 10 years besides undertaking the entire maintenance of AFC for ten years. Axis Bank will issue co-branded cards to the users of Kochi Metro for paying the fares as well as using them for all kinds of merchandise including e-commerce. KMRL will also be paid 0.2% of Axis Bank’s gross revenues from the utlilisation of co-branded pre-paid cards outside Kochi Metro system. An Agreement in this regard was today signed between KMRL and Axis Bank in the presence of Minister of Urban Development Shri M.Venkaiah Naidu here today. CMD of KMRL Shri Elias George and MD and CEO of Axis Bank Ms.Shikha Sharma signed the Agreement. Speaking on the occasion, Shri Venkaiah Naidu said that the KMRL and Axis Bank tie up is a unique technological and business model innovation, the first of its kind in the world and beneficial to both. He said that this initiative also helps in creating a cash less system besides enabling financial inclusion. The Minister asked KMRL to consider linking the co-branded pre-paid smart cards to Pradhan Mantri Jan Dhan Yojana to deepen financial inclusion. The Minister also asked Secretary(Urban Development) to explore emulating Kochi Metro’s innovation by other Metros in the country. 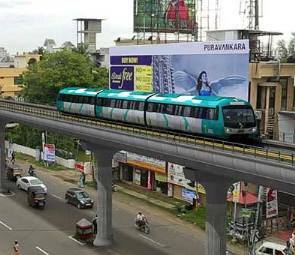 Kochi Metro is a joint venture of the Governments of India and Kerala being constructed at an approved cost of Rs.5,181 cr. KMRL has so far saved about Rs.800 cr through innovative procurement processes. Of the project length of 25.612 kms, 18 km is scheduled to be commissioned by June, 2016 and the rest by June, 2017. Axis Bank has formed a Consortium of service providers and will soon start work on installing AFC system.